Here are a few seasonal tips for updating your home’s curb appeal over the long holiday weekend from CertainTeed, a leading North American manufacturer of exterior and interior building products. Memorial Day is right around the corner, and the carefree spirit of summer is back. Now is the time to ensure your outdoor living space is in tip-top shape for those upcoming barbeques celebrating those who serve and have served our great country. 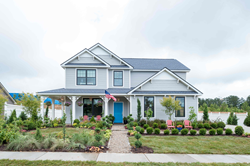 Here are a few seasonal tips for updating your home’s curb appeal over the long holiday weekend from CertainTeed, a leading North American manufacturer of exterior and interior building products. There is no easier way to bring new life to your yard than by planting some fresh plants and flowers. Check out All-America Selections for ideas, which include select varieties of carnations, cosmos, geraniums, pansies and zinnias as 2018 flower winners. Don’t overlook the importance of fencing in defining and beautifying your outdoor living space. Consider Bufftech® Brookline vinyl fence to incorporate this season’s trend of horizontal pickets into your yard. SimTek® EcoStone® is also a great option – to deliver strong wall performance with a stone look for a fraction of the cost. Plus, both are maintenance-free, fade-resistant and provides a sound barrier to noise pollution. Ready to tackle a major home project? Give your house a facelift by selecting some fresh siding. Cedar Impressions® shakes and shingles will add a rustic flair to your home, while STONEfaçade™ architectural cladding system will provide an upscale stone accent without breaking the bank. Both will provide an excellent return on investment should you decide to sell your home. Simply adding a pop of color to your front door can completely change the look of your house and boost your curb appeal. Tape a few paint chips to your door to get a sense of what will look best. Choose a color that reflects your personality, and don’t feel the need to stay conservative. According to HGTV.com, bright yellow, kelly green and orange are popular trends for front door colors. Just be sure to use exterior paint if you don’t have a glass or storm door protecting your front door from the weather. Expand your living space with the addition of a front porch or deck. Incorporate a distinct railing with the multitude of options from EverNew®, which come in either vinyl or composite and host a variety of colors, including black, white, almond, rustic rose, warm spice and clay. Consider the idea of adding the UnderShield® water diversion system to a multi-level deck. A true party-saver, the handsome ceiling, which clips onto and hides the deck’s supportive beams, enhances a deck’s unsightly underside and ensures the area underneath stays dry and usable even through summer rainstorms. Whether you’re looking for a quick DIY project to keep you busy over the long weekend or are ready to take a leap and make a larger investment in your outdoor living space, we hope this list brings you some inspiration. For additional outdoor living ideas and inspiration, visit http://www.certainteed.com or download the CertainTeed iDreambook™ from the Apple® app store.Images, product samples and industry comments are available upon request. To speak to an expert, contact Victoria Gallagher of CertainTeed Corporation at Victoria.M.Gallagher(at)Saint-Gobain(dot)com or (610) 893-6002. Through the responsible development of innovative and sustainable building products, CertainTeed, headquartered in Malvern, Pennsylvania, has helped shape the building products industry for more than 110 years. Founded in 1904 as General Roofing Manufacturing Company, the firm’s slogan “Quality Made Certain, Satisfaction Guaranteed,” quickly inspired the name CertainTeed. Today, CertainTeed® is a leading North American brand of exterior and interior building products, including roofing, siding, fence, decking, railing, trim, insulation, drywall and ceilings.